See more objects with the color dimgrey darkslategrey grey rosybrown or see all the colors for this object. This is a Miser's purse. It is dated early 19th century and we acquired it in 1951. Its medium is silk, steel and its technique is embroidered netting. It is a part of the Textiles department. Miser’s purses are oblong pouches primarily used to carry coins. They usually have center slit openings with pairs of sliding rings to secure coins in the purses’ ends but sometimes clasp closures are used. The purses probably evolved from the sixteenth-century practice of storing coins in the toe of a stocking. They were called short or long purses based on their lengths, which were gender specific until the mid-nineteenth century, or sometimes gentlemen’s purses. The name miser’s purse seems to have originated at the turn of the twentieth century, near the end of their popularity. 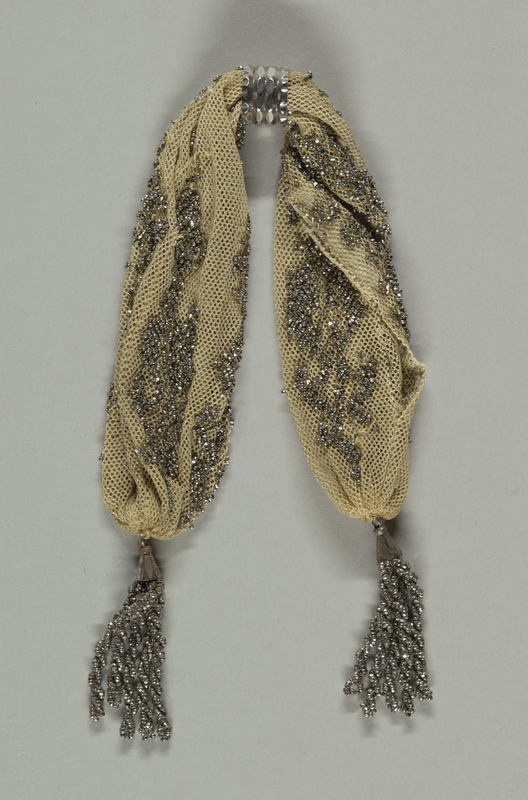 Miser’s purses were usually silk with glass or metal beads, and could be netted, knitted or crocheted. While many of the designs were purely ornamental, some were intended to make the purses more functional, for example by making the two ends different colors or shapes, or using gold beads at one end and silver at the other, to help its user distinguish between gold and silver coins. They were typically carried by men in a coat or trouser pocket, and by women in a skirt pocket or reticule. This object was catalogued by Susan J. Brown. It is credited Gift of Richard C. Greenleaf.